I ASK myself frequently. But without the benefits of psychotherapy, I only know what’s in the conscious side. My name is Jorge Harada, and I play guitar. Nice to meetcha. I was born in Mexico City, MX in the late 60’s. 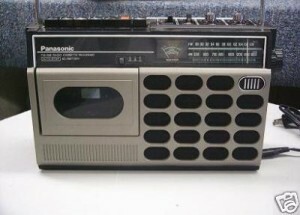 Got into music at 10 (during the late 70’s) when my folks gave me a Panasonic portable radio with cassette player. The radio had FM-AM plus 2 short-wave bands, and would spend many hours tuning in music and sounds from everywhere: local stations broadcasting rock, soul, pop, plus regional mexican music, and would pick up ‘border blaster’ stations late at night, plus other transmissions from all over the world. This is when there was plenty of bandwidth available for everyone, and the only non-commercial civilian radio transmissions were either CB or HAM radio. Anyway, while tuning in all this radio programming really received quite an education in music, and discovered that it spoke to me in ways that other mediums did not. Soon, I started buying my records with my own money, and discovered the art of listening to all the details in a song, especially becoming keenly aware of how certain songs would make me feel – music started to generate an emotional response based on melody and rhythm. Just for fun, I would also make my own radio shows by waiting until a good song came on the radio, I’d press RECORD, and once I got 2 or 3 in a row, I’d record a brief break introducing the songs and who they were by in my best “radio announcer” voice. Since the Panasonic had a built-condenser microphone, this was easy and fun to do. I must’ve recorded and re-recorded on the same cassettes dozens of times. Sadly, these recordings were lost in a flooded basement and there are none in existence. In the early 80’s, my family moved to Los Angeles. At that time, Los Angeles was a hotbed of live music, especially for punk rock and new wave, plus all the bands that were putting a modern twist to country and rockabilly, melding them with the energy and attitude of punk. Meanwhile, on the ‘east side’ of Dodger Stadium, a hybrid of music was being created: mexican traditional music along with american roots music. In the sleepy town of South Pasadena where we lived, up on the northernmost edge of town and on the “wrong side of the 110 Freeway”, I happened to ask a friend at school who was a punk “Hey, what’s punk rock?” He smiled and handed me a Posh Boy compilation tape called PUNK AND DISORDERLY. This music hit me like a bolt of lightning. After I asked him if he had anymore tapes that he could loan me, he handed me THE CLASH and LONDON CALLING by The Clash. Life as I knew it had ceased to exist. I realized that music was a big part of who I was, and being a teen struggling for some identity, I found something to identify with – finally! I started playing guitar by accident. My mom had a Tres Pinos nylon string guitar in the house when we lived in Mexico – she took a few lessons, but it seemed that life always “got in the way” and never picked it up. We ended up hand carrying this guitar on a 3-day bus ride all the way from Mexico City to Nogales, AZ. Lived for a month in Jean, NV and then went to California. This guitar was always there – in its case, propped up in the corner, waiting for someone to play it. As luck would have it, I had a neighbor friend named Shawn Tynan who was a class ahead of me, he played guitar and was quite advanced. Shawn showed me a few chords on the nylon string, showed me how to tune it, and I got to work. I can’t describe to you the feeling that you get when you finger your first chord shape, strum the strings and it sounds like music. It’s magical, man. Really. Been playing the guitar for over 30 years . My first ‘professional’ show was at a Battle Of The Bands in Anaheim, at the age of 16. Spent most of the 80’s slugging it out in the Los Angeles underground music scene, was overseas for a few years, and upon returning in the 90’s, music had radically changed with the dawn of grunge. Instead of looking forwards, I chose to look backwards. 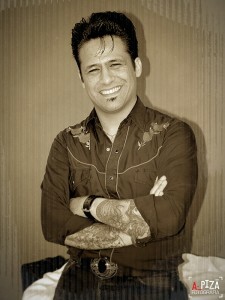 From punk, worked all the way back to rockabilly and classic country. Eventually, all these sounds and tones from rockabilly and CW to punk, roots rock, tex-mex, surf, traditional mexican music, delta blues, and more started blending together to create my own voice. Cumulatively speaking, I’ve amassed over a quarter million miles of touring across North America, Europe, and Australia. I’ve got a few records under my belt, and have performed on a few others. I feel very fortunate and grateful to be able to play music as there’s always more to learn, and more to share. I’ve made many lifelong friends in this industry and have had the opportunity to work for, collaborate with, and learn from very talented people. Well, that about wraps it up for now. If you happen to find yourself in Austin, TX feel free to check out my calendar and come down to a show, or I’ll see you at a town near you!